Meetings are held on the first Tuesday in the month, February to December, at the Moonah Community Centre, 7 Gormanston Road, Moonah commencing at 10.00am. Guest speakers at the monthly meetings cover a wide variety of topics relative to early Tasmanian history, its people, life and times and development. Some recent topics have included Photographing Tombstones, Life & Death in Old Hobart Town, Orphan School, the Female Factories and Governor Sir John Franklin, William Bligh, Children of Convict Parents. From time to time member excursions visit historic sites and buildings. The next Annual Floral Tribute will be conducted at 11.00 AM Wednesday, 20th February 2019. Each year representatives from the original inhabitants, government, councils, Mission to Seamen, Historical Societies and our members and friends attend the tribute at the Hunter Street monument to commemorate our First and Early settlers. The Hobart Veterans Brass Band will be in attendance so arrive early to enjoy the music. 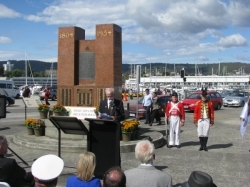 This annual tribute is held on the 20th of February each year and representatives from the original inhabitants, government, councils, Mission to Seamen, Historical Societies and our members and friends attend the tribute at the Hunter Street Monument to commemorate our First and Early settlers. Morning tea is later enjoyed at a local cafe. For as little as a $30 annual subscription you can have the privilage of hearing interesting and informative presentations about Tasmania and its early settler history. Coming up in the next three months you can hear these speakers at the Moonah Community Centre, 7 Gormanston Road, Moonah commencing at 10.00am. Tuesday, 6 November 2018: Professor Stefan Petrow whose topic is "Edward Swarbrick Hall". Tuesday, 2 October 2018: Jenny Parrot and Wendy Bowman from the Royal Botanical Gardens speaking about the Bi-Centenary of the Gardens. Tuesday, 4 September 2018: Owen Winter speaking on the History of the Hobart Barracks. Posted on 07 Aug 2018 by webmaster. This is an invitation to members and friends to join us for lunch at 12 noon at the Black Buffalo Hotel, cnr. Federal and Letitia Streets, North Hobart on Saturday 25 August 2018. There will be a limited choice menu for the princely sum of about $23 each, with the a la carte menu available as well. Drinks may be ordered at the bar. Posted on 31 May 2018 by webmaster. Friday 13th September 2013. Mr Reg Watson presented a talk for the Lindisfarne Historical Society at the Lindisfarne Civic Centre, Lincoln Street, Lindisfarne at 7.00 PM for the 210th Anniversary entitled JOHN BOWEN AND THE FOUNDING OF TASMANIA. Scott Seymour launched his book WHITE LIES at the above event. 1 to 3 March 2013 - The Northern Midlands Council organised a Gathering on the Norfolk Plains to commemorate 200 years since the Norfolk Islanders settled the plains, an area occupied by Perth, Longford and other nearby townships in the area originally known as Norfolk Plains. A full program of events was planned by the Northern Midlands Council over the weekend of 1 to 3 March 2013 that will include a Descendants' Day. The event was be launched by former Governor of Tasmania, the Hon. W.J.E. Cox AC RFD ED.